question_answer1) _______ are the numbers which are multiplied together to get another number. question_answer2) A ____ is a diagram which is used to break down a number by dividing it byits factors until all the numbers left are prime numbers. question_answer3) ______ is the factor of every number. question_answer4) Every number is the ______ factor of itself. question_answer5) The factors of any number are ______ the number. question_answer6) We can find factors by ______. question_answer7) When we divide one number by another and there is no remainder, the divisor A thequotient are the ______ of the first number. question_answer9) Every number except 1 has at least ______ factors. question_answer10) A _____ is a number that is the product of a given number and some othernumber. question_answer11) A multiple is basically a ______. question_answer12) We can find the ______of a number by multiplying it by 1,2,3,4, and so on. question_answer13) Pick odd one out. question_answer14) Every multiple of a number is _______ the number itself. question_answer15) There is no end to the ______ you can get of a particular number. question_answer16) 56 is a______of 8.
question_answer17) The common factors of 56 & 44 are ______. question_answer18) Is 6 a factor of 78? 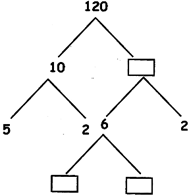 question_answer20) Fill in the blanks by choosing the correct option for the given factor tree of 120.
question_answer21) Directions: Consider the following statements and choose the correct option. Statement A: A number which has more than two factors is called a prime number. Statement B: A number which has only two distinct factors, is called a compositenumber. question_answer22) Directions: Consider the following statements and choose the correct option. Statement A: If one of the two given numbers is a multiple of the other, the greaternumber is the L.C.M. of the given numbers. Statement B: The Highest Common Factor of two or more given numbers is the greatestamong all their common factors. question_answer23) Directions: Consider the following statements and choose the correct option. Statement A: The multiples of 8 are 16, 24, 32, 40, 48.... Statement B: The common multiples of 8 & 6 are 24 & 48.
question_answer24) Directions: Consider the following statements and choose the correct option. Statement A: The H.C.F. is the greatest number which divides two or more numberswithout a remainder. Statement B: The L.C.M. of two or more numbers is the smallest number which isdivisible by each one of the given numbers. question_answer25) Directions: Consider the following statements and choose the correct option. Statement A: 30 is the smallest number which when divided by 10 and 15 leaves no remainder. Statement B: 4 is the largest number that divides 12 and 20 without a remainder. question_answer26) Which of the following represents the complete factor tree for 84? question_answer27) In how many different ways we can arrange 24 glasses on a kitchen shelf? Choose the best answer. question_answer29) Which of the following statements are true or false. A. If a number is divisible by 6, it must be divisible by 12. B. If a number is divisible by 6, it must be divisible by 3. C. If a number is divisible by 100, it must be divisible by 25. D. A number divisible by 256 is even. question_answer30) Directions: Read the passage and complete it by choosing the correct option. A number is divisible by __(30)__ if it has 0 or an even number in its ones place. A number is divisible by 3 if the __(31)__ of its digits is divisible by 3. A number is divisible by 5 if it has __(32)__ or 5 in its ones place. A number is divisible by __(33)__ if it is divisible by both 3 and 5. A number is divisible by another number if it is also divisible by its __(34)__factors. question_answer31) Directions: Read the passage and complete it by choosing the correct option. A number is divisible by __(30)__ if it has 0 or an even number in its ones place. A number is divisible by 3 if the __(31)__ of its digits is divisible by 3. A number is divisible by 5 if it has __(32)__ or 5 in its ones place. A number is divisible by __(33)__ if it is divisible by both 3 and 5. A number is divisible by another number if it is also divisible by its __(34)__factors. question_answer32) Directions: Read the passage and complete it by choosing the correct option. A number is divisible by __(30)__ if it has 0 or an even number in its ones place. A number is divisible by 3 if the __(31)__ of its digits is divisible by 3. A number is divisible by 5 if it has __(32)__ or 5 in its ones place. A number is divisible by __(33)__ if it is divisible by both 3 and 5. A number is divisible by another number if it is also divisible by its __(34)__factors. question_answer33) Directions: Read the passage and complete it by choosing the correct option. A number is divisible by __(30)__ if it has 0 or an even number in its ones place. A number is divisible by 3 if the __(31)__ of its digits is divisible by 3. A number is divisible by 5 if it has __(32)__ or 5 in its ones place. A number is divisible by __(33)__ if it is divisible by both 3 and 5. A number is divisible by another number if it is also divisible by its __(34)__factors. question_answer34) Directions: Read the passage and complete it by choosing the correct option. A number is divisible by __(30)__ if it has 0 or an even number in its ones place. A number is divisible by 3 if the __(31)__ of its digits is divisible by 3. A number is divisible by 5 if it has __(32)__ or 5 in its ones place. A number is divisible by __(33)__ if it is divisible by both 3 and 5. A number is divisible by another number if it is also divisible by its __(34)__factors. question_answer37) What is the greatest common factor (6CF) of 42 and 72? question_answer38) What is the seventh multiple of 9? question_answer39) How many factors do prime numbers have? question_answer40) Which of the following pairs of numbers have a least common multiple (LCM) of 56? question_answer41) Which two numbers do not have 11 as their greatest common factor? question_answer42) A is two numbers multiplied together. question_answer43) Which pair of numbers has a greatest common factor of 1? question_answer44) Which list shows the first five multiples of 7? question_answer46) A number that has more factors than one and itself. Or, a number that has morethan two factors. For example: 8 has factors 1 and 8, but it also has factors 2and 4.
question_answer47) The smallest multiple (other than zero) that two or more numbers have in common.For example: the multiples of 3 are 3, 6, 9, 12, 15.... and the multiples of 5 are 5, 10, 15, 20..... The smallest multiple that both 3 and 5 have in common is 15.
question_answer48) A positive number that is divisible only by itself and the number one. For example:3 has only two factors - one and three - one and itself. question_answer49) What is the largest factor that two or more numbers have in common. For example: The factors of 8 are 1, 2, 4, and 8. The factors of 12 are 1, 2, 3, 4, 6, and 12The largest factor that both 8 and 12 have is the number - 4. Four is the largest number both 8 and 12 have in common. question_answer50) Beginning at 8:30 am, the Calgary Zoo starts tours of the tiger and elephantenclosures. Tours for the tiger enclosure leave every 15 minutes. Tours of theelephant enclosure leave every 20 minutes. How often do the tours leave at the same time? question_answer51) Which number is neither a prime number nor a composite number? question_answer52) Read the statements and choose the correct option. Statement A: If a number can only be divided by one and itself, it is a prime number. Statement B: Prime number has only 2 factors, one and itself. question_answer53) Which of the following best defines the properties of a composite number? question_answer54) Which list contains all prime numbers? question_answer57) Bhushan counted to 60 using multiples of 6. Which statement is true about multiples of 6? question_answer59) The smallest 4-digit number exactly divisible by 12. 15. 20 and 35 is _____. question_answer60) Which of the following pairs of numbers are co-primes?